The Olympus Stylus SH-50 is a powerful and versatile compact digicam, designed for the person looking for the best balance between still images and videos. Great features, quality and performance make this a must see camera for the price. Read more in our Full Conclusion. In early 2013 Olympus announced the SH-50 iHS, "a new premium, compact long zoom camera" with a host of impressive features trickled down from their flagship Micro Four Thirds cameras (like the OM-D E-M5). They begin with an upgraded, 16-megapixel backside illuminated CMOS image sensor, mated to the TruePic VI Image Processor developed for the Olympus PEN series, and a 24x optical zoom lens with a 35mm equivalent of 25-600mm. If you like shooting HD video, the SH-50 has a number of great options, including shooting Fully HD 1080/60i video in normal mode, or you can fire up High Speed Movies and shoot 120 frames per second at a 720p resolution, which allows users to see extremely detailed and fluid slow motion as if they were watching a real Hollywood movie. The camera's 5-Axis video stabilization will also help to capture video while holding the camera in hand. The SH-50 also features a 3.0-inch LCD touch screen with a helpful (and optional) Live Guide graphic user interface to help change settings and capture stunning pictures. If you're the type of photographer that likes to shake things up a bit or have as much control over your images as possible, you'll enjoy the 11 Magic Filters, Beauty Mode (with Make-up), HDR Backlight Adjustment, and Advanced Shadow Adjustment Technology. Smart Panorama is also included to capture wide vistas and full 360-degree surroundings. 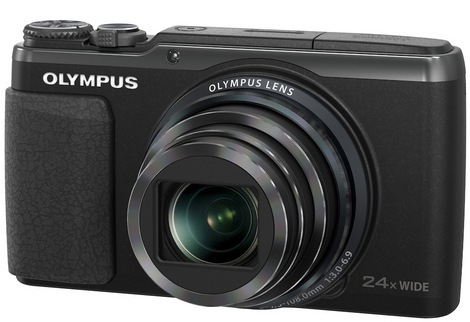 Available in black, silver or white, the Olympus SH-50 iHS will have an estimated MSRP of $299.99. Click the Buy button at the top right of this page to see the most current online pricing.